Summer is here and we are going to the park a lot. Now that the snow is gone and the weather is nice, skinned knees are bound to happen. 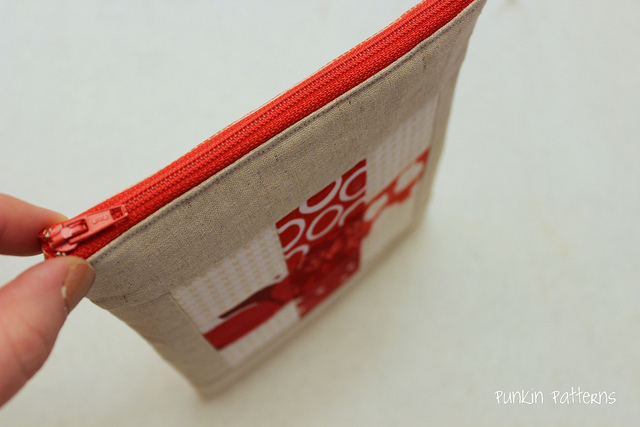 This handy little First Aid Zip Pouch holds everything we need and goes with us everywhere. 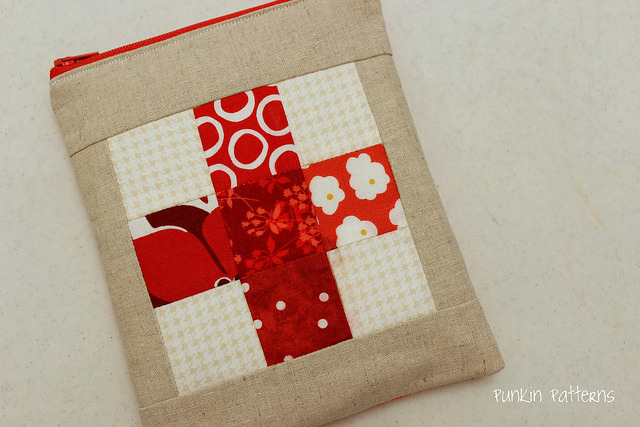 It is a great little project to use up some of your pretty red and white scraps OR you can just make it with any colors you like and have a nine patch on top instead. It is the perfect size. 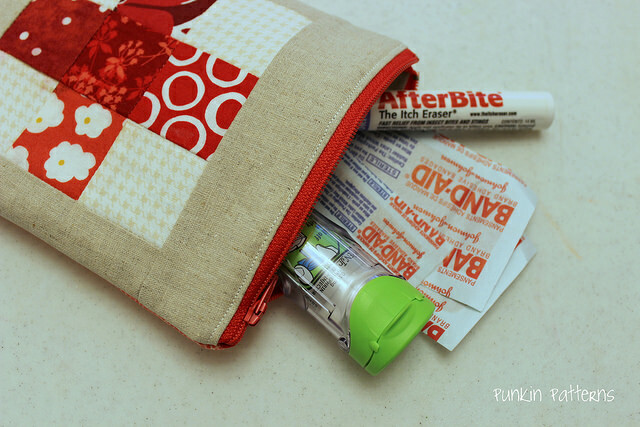 It fits two Epi-Pens (for those of you who have to carry them), large knee/elbow size band-aids (so necessary with kiddos), cleaning wipes and of course, an After Bite stick for those pesky mosquito bites and lots more. 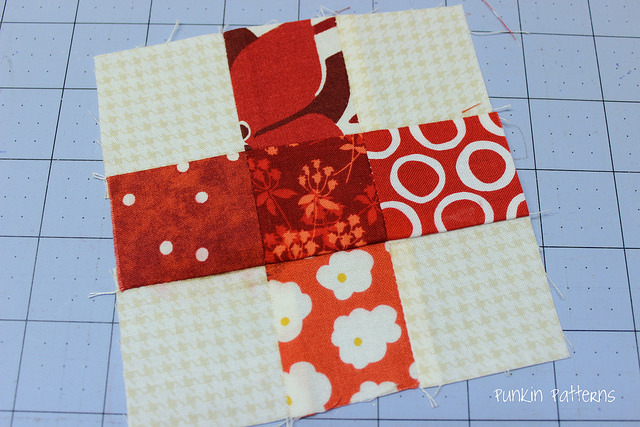 Lay out your 2″ squares how you want them to look. 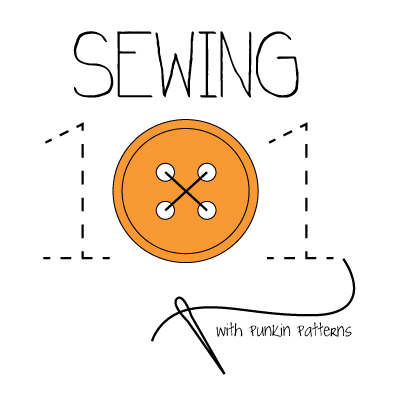 Sew them together in rows. 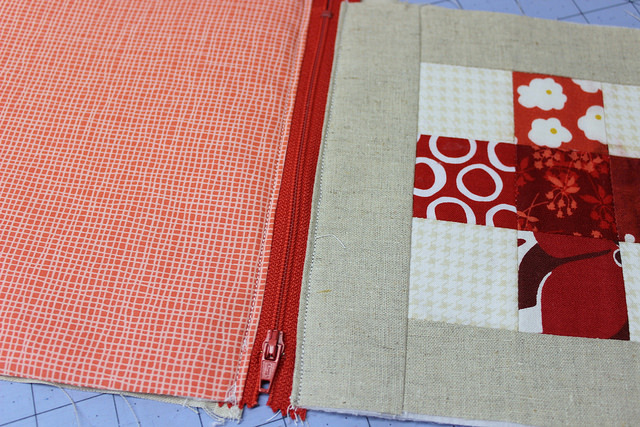 Then sew the rows together. 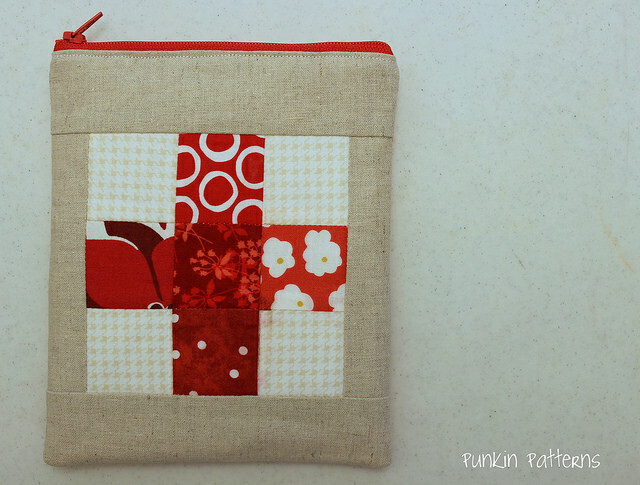 Your 9-patch should be 5″ square. 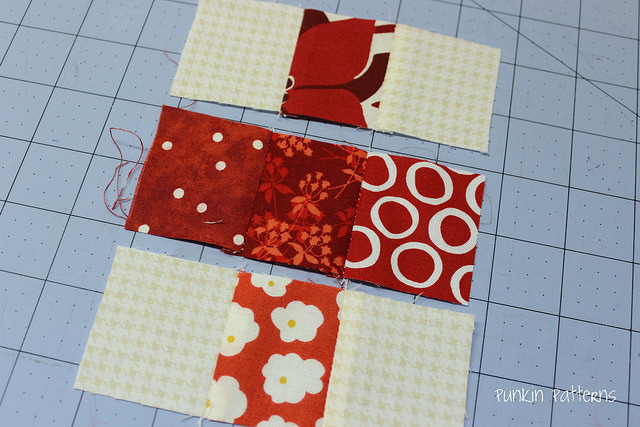 Sew on your 1.5″ x 5″ pieces on each side. 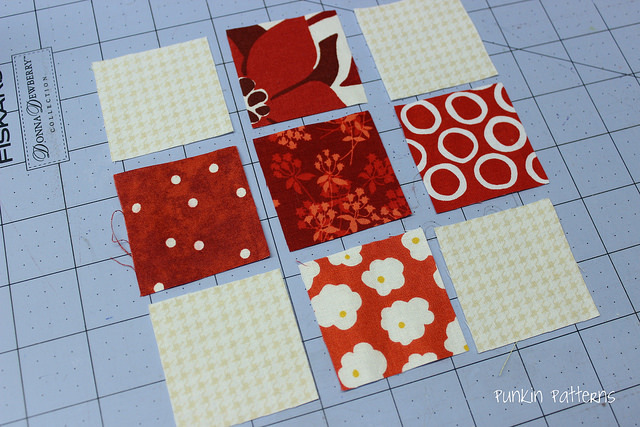 Your block should be 5″ x 7″ now. 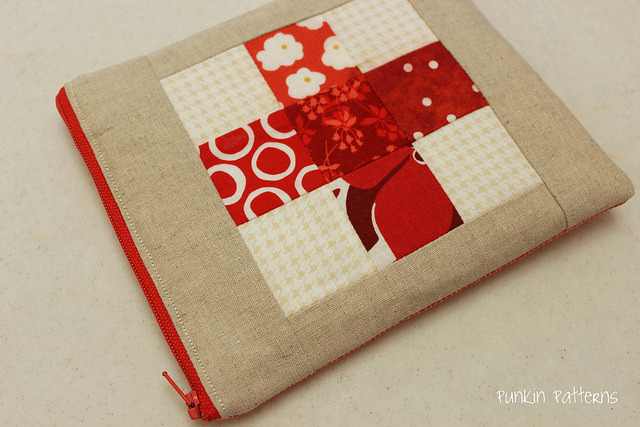 Then sew on the 2.5″ x 7″ pieces on the top and bottom. 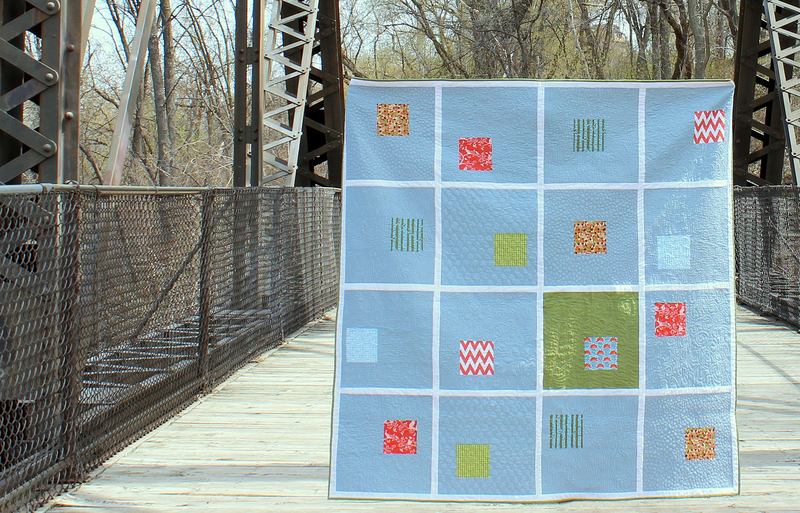 Your block should now be 7″ x 9″. 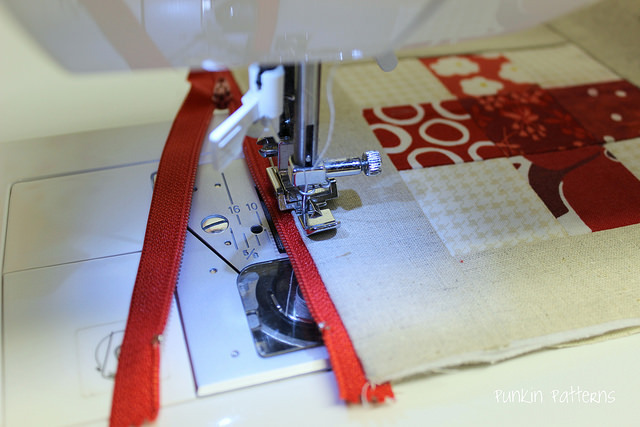 Using a zipper foot, sew along that edge to secure the zipper and lining. 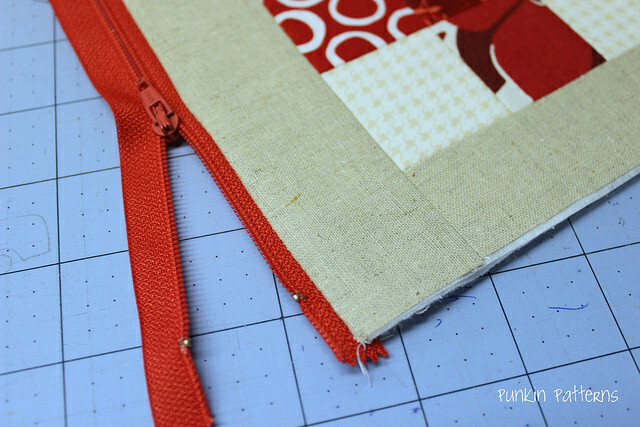 Top stitch along the edge of the zipper about 1/8″ from the edge. 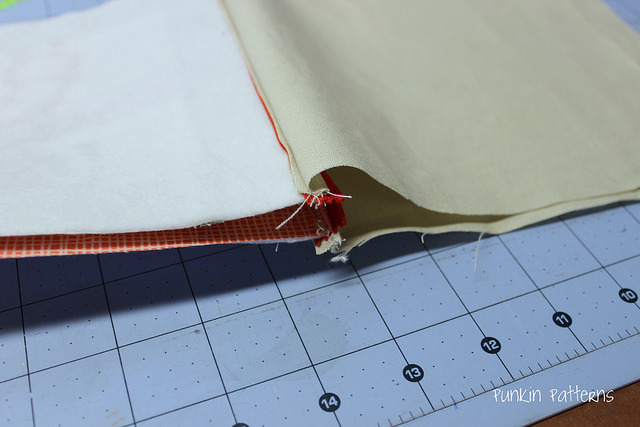 Now do the same for the other side, using the backing and other piece of lining. 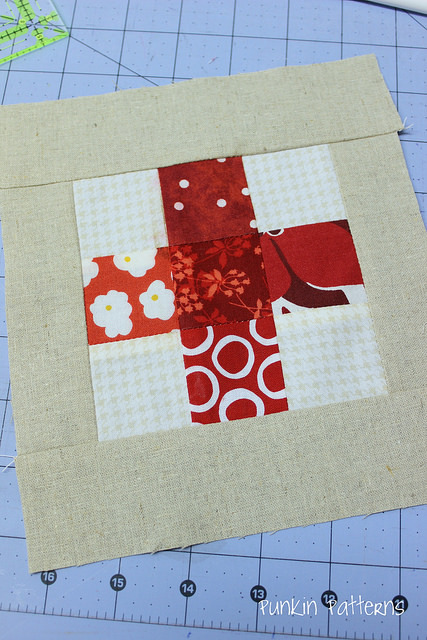 Pull up the top piece and backing, right sides together and pin. 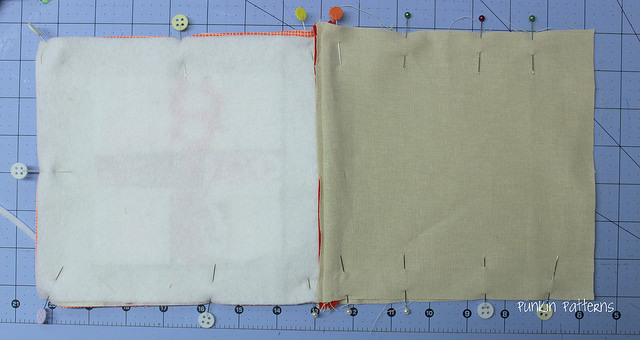 Pull the two lining pieces together as well, right sides together. 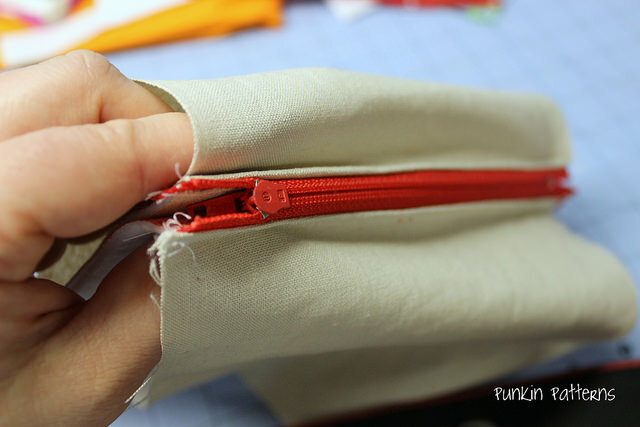 Make sure the zipper is pushed toward the lining. 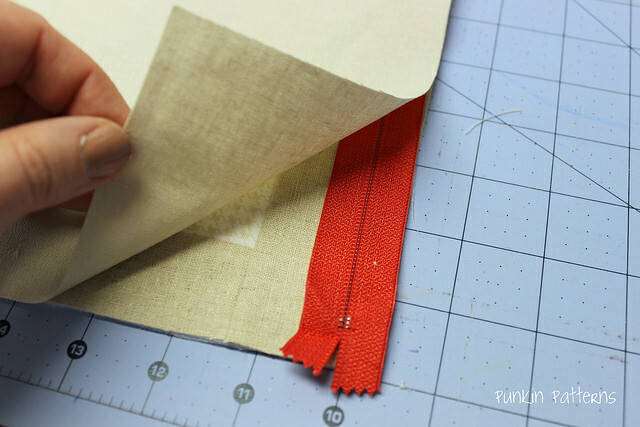 Sew around the edge, leaving the bottom of the lining open for turning. 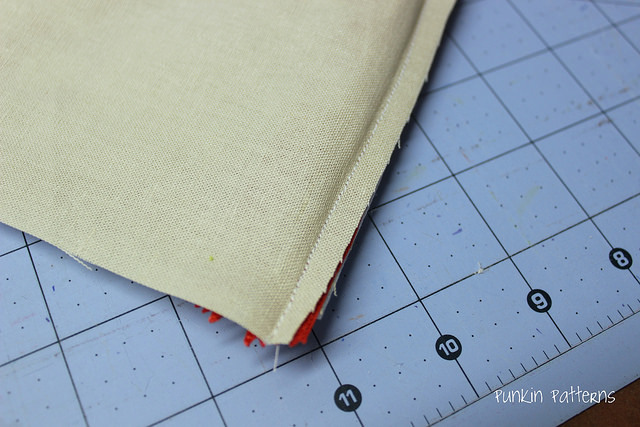 Trim the excess at the corners (for turning) and any excess fabric at the sides if needed. 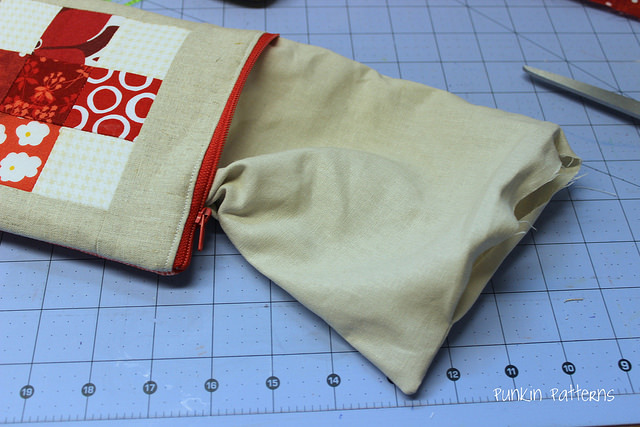 Push the lining into the bag and then pack all your first aid items and you’re done! 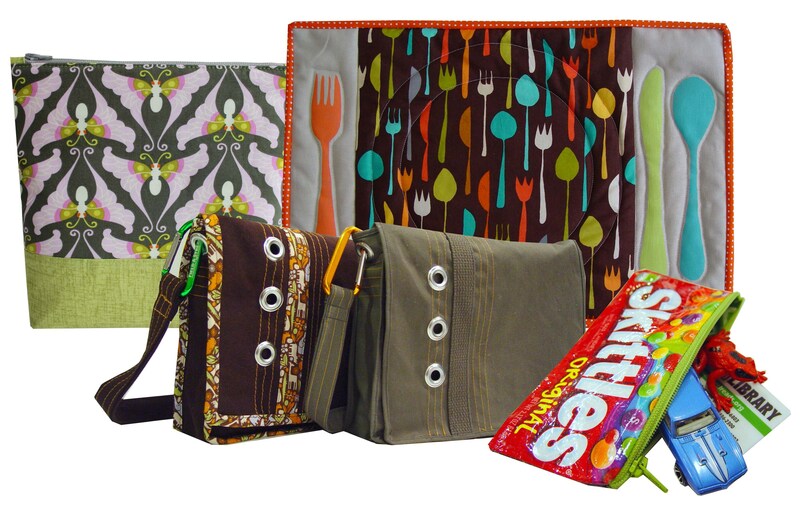 Hopefully you won’t need the supplies inside, but if you do, you’re ready! Finished size is 6.5″ w x 8.25″ h.
Love this! Even though I don’t have kids it would work great for my hubby who never knows where to find our emergency supplies (including my epi-pen!) when we are camping at the lake! First aid zip pouch is really beautiful and very useful during any injury. I always prefer to have first aid kit in my home and taking first aid training from UK Health and Safety Consultant.